The cauldrons in Witch's Brew. These are the primary way to score points. The Iron Witch competition is beginning! All the best druids, witches, wizards, and warlocks are ready to brew their best potions, and the proceedings will go like clockwork! Instead, the potion pantry is a mess. Their assistants, far from being fleetfooted, are tripping over every obstacle, and the contestants themselves are having some sort of identity crisis, not sure who is who or what is what. Can you rise above your rivals? Can you harness the whirlwind and ride to victory? Find out in Witch’s Brew! 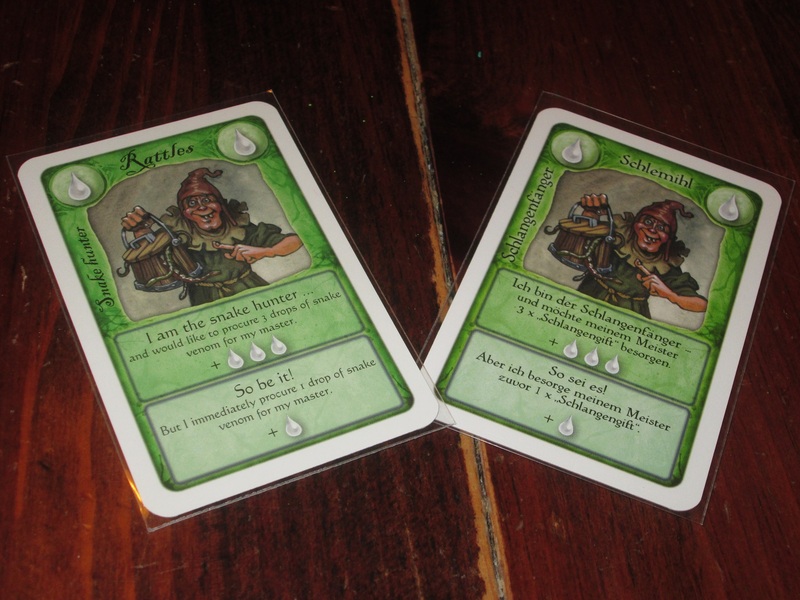 Witch’s Brew is a role selection/resource management card game for three to five players. 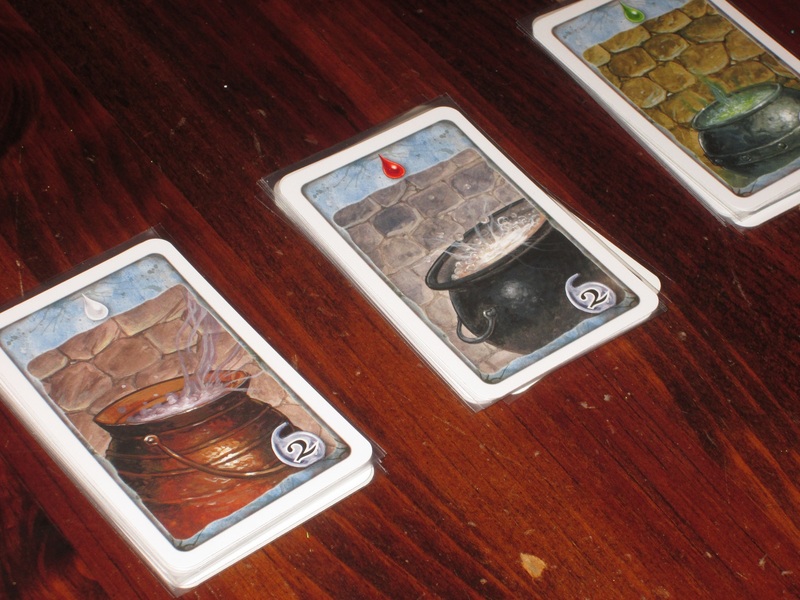 Players are witches in a potion-making contest. They recruit helpers to gain ingredients, money, and ultimately potions. The player with the most points is the winner. 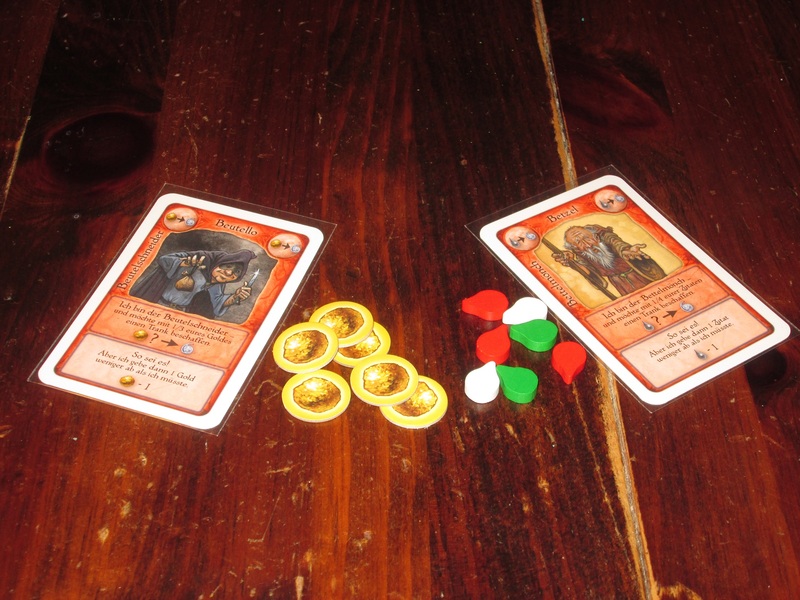 Each player receives an identical hand of twelve role cards, one of each ingredient (wolf’s blood, snake venom, and herbs), and two gold pieces. The potion stacks are set in the center of the table in ascending order according to the points they generate. 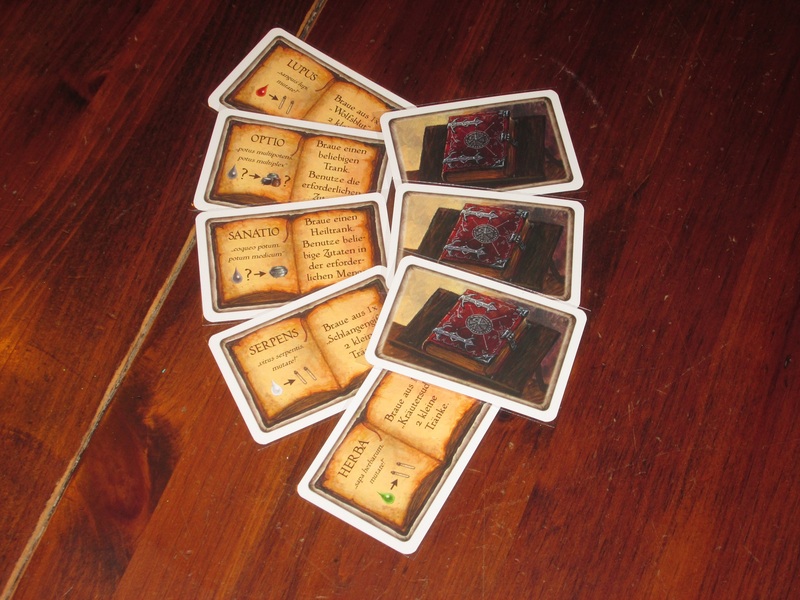 The spell cards are shuffled and placed in a face-up stack within view of the players. Witch’s Brew set up. In addition, each player has an identical hand of cards. 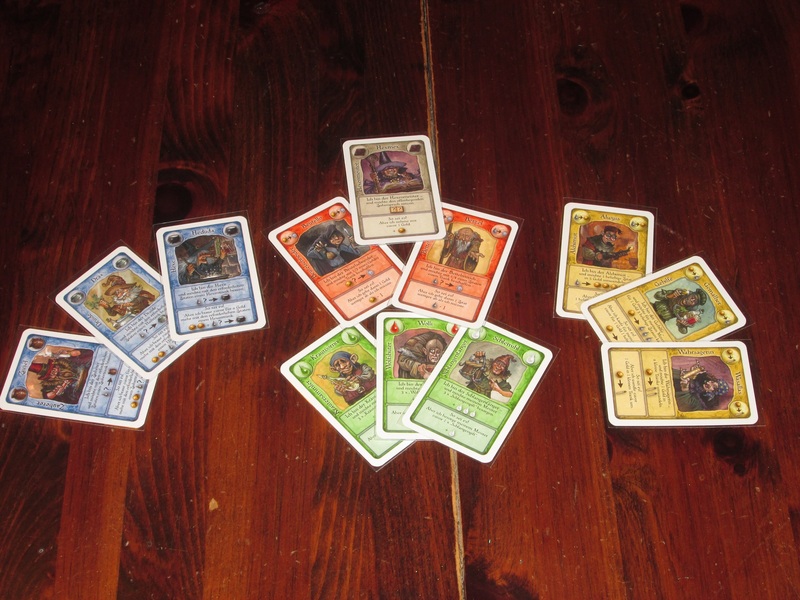 At the start of each round, each player will choose five of their twelve cards to play in the round. Green cards help players gather ingredients, blue cards allow players to trade ingredients for points, gold cards allow players to get and use gold, red cards steal things from other players, and the gray warlock card allows players to use the spellbook. Once each player has chosen a hand of five cards, the round begins with the player who last claimed a role. In each cardplay in the round, the leading player plays a card and claims the role. Each card has two possibilities: a strong action (claiming the full role) and a favor. Once a player claims a role (e.g., “I am the Wolf Keeper”), each player who chose that card this round must play it, in clockwise order. (If players didn’t choose it, they simply pass.) Players who are holding the chosen card have two options: they may either claim the favor by saying, “So be it!” (allowing them to execute a lesser version of the role’s action) or claim the role (“I am the Wolf Keeper!”). Only the last player to claim a role gets to execute the role’s action, but any number of players may claim the favor. A new cardplay begins with the player who won the strong action, and the round ends once all players have played their cards. Each player begins each round with the same twelve-card hand. Cards are color coded, so it’s easy to tell what each set does. The game continues in rounds until players claim four potions showing ravens. At the end of the round where the fourth raven potion is claimed, players add up their points. The player with the most points is the winner. Double Double, or Toil and Trouble? Witch’s Brew is a hard game to track down these days. The English edition regularly sells for far more than its original MSRP, and German copies (at least at present) are hard to come by. So if you have a chance to get it, is it worth it? Potions showing ravens push the game toward its end. Witch’s Brew is unlike any other game I’ve played (aside from Broom Service, it’s descendant–more on this later). The cardplay each round is absolutely fascinating. Each round, as you assemble your cards to play, you have to look at what you’re trying to accomplish and what the other players are trying to accomplish. You have to weigh what you absolutely cannot live without and consider which actions you might let go as favors. Because let’s face it: you’re not going to get every action you try for. And this is the fun of the game. Much like GOB’s “illusions” on Arrested Development, your actions are not always reliable. You have to plan around your own futility. But that is what makes it so gratifying when what you planned comes to pass. It is a thing of beauty when you get what you need and a round turns out better than you expected. 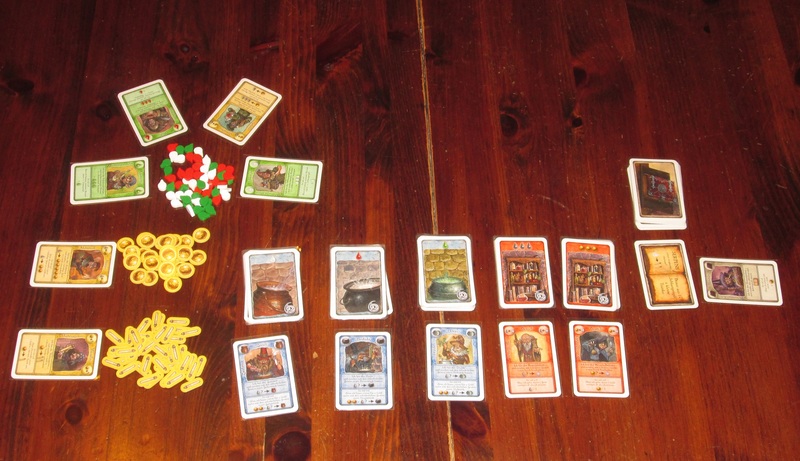 The setup with each role card by what it targets. There are lots of ways to get what you want in Witch’s Brew. It seems like twelve choices would make the game hard to parse at the start of each round, and it is at first. But the game flows so easily that it doesn’t take long for players to adapt. Much of this is due to the role cards sharing colors. All the green cards allow you to collect ingredients, the blue cards let you buy potions, etc. Once players understand this, choosing a new hand is a cinch because they can evaluate their situation and easily tell which roles are necessary to them. It’s hard to overstate just how brilliant the role/favor dynamic is in Witch’s Brew. It is the risk/reward decision honed and balanced to a knife’s edge. There’s enough information in the game that players can make an informed decision whether they should claim the full role, but because there are other humans around the table, certainty is hard to come by. I might think it safe to claim that I’m the Herb Collector–Look at that pile of herbs that Jimmy is sitting on!–only to realize that Jimmy has decided, for reasons all his own, to hoard all the herbs, if only to make my life miserable. The fun of the game is in the gaps, the spaces the game creates that are outside itself where players can interact and have a great time. There is tension every round when you play a new card, and it is a joy and a revelation to see what other players do. The cauldrons in Witch’s Brew. These are the primary way to score points. Of course, the goal of the game is to score points, so players have to keep their eyes on the prize. 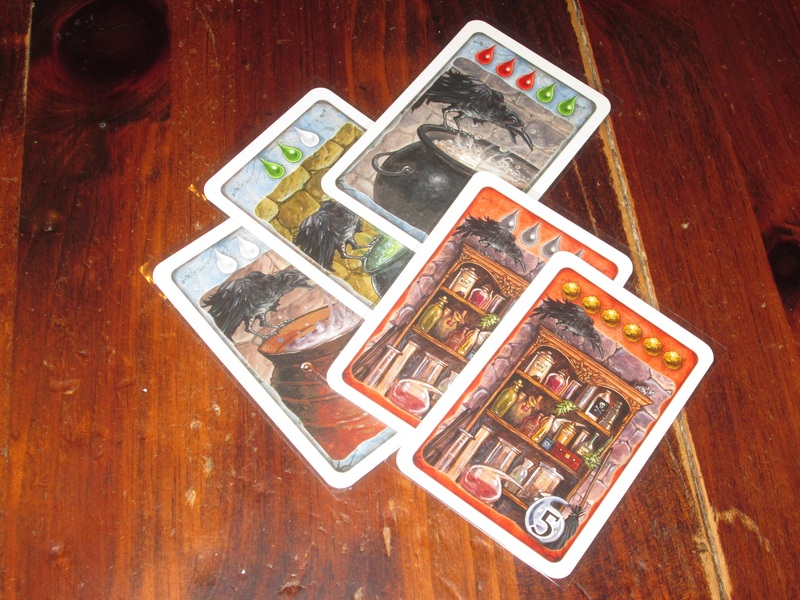 There are five prizes in Witch’s Brew, to be exact–that is, five places from which players can collect big points (with back-door ways in addition to these). Players can brew potions or steal them, and much of the game is trying to avoid the logjam that develops around certain pots. And this is one thing I appreciate about the game: while it’s no fun to have your action stolen from you, there are many different ways to achieve the same ends. So while brewing in a pot may seem like the only viable strategy, a warlock card might let you brew a potion in another way. Keep getting locked out of ingredients? Steal them from another player with the begging monk. Have money but no ingredients? Either buy ingredients or buy vials, worth straight victory points. Players are rarely without recourse, so long as they choose their cards well. And even when they don’t choose well, it’s hilarious to watch the proceedings go awry. Watch out for the thief and begging monk. They will take your hard-earned gains. Witch’s Brew could accurately be described as chaotic, but while chaos in games is usually not my bag, I’m okay with it in this game. There are several reasons for this. As I’ve already described, the chaos is rarely completely damaging. There are enough avenues to get what you need that you’ll always have an option. Another reason is that while the game is chaotic, the chaos in the game is entirely player generated. Witch’s Brew reminds me in some ways of Libertalia, a game I’m very fond of. In that game players similarly choose cards from a common pool, and the game is in the fun interactions that result from player maneuvering. In both games your plans can be frustrated, but while you might point your finger at the game, three fingers are pointing back at yourself for choosing the card(s) you did. And finally, what keeps Witch’s Brew’s chaos manageable is the theming. I don’t generally care for games about magic and witches, but here it makes perfect sense. And even more than that, it’s fun to have to say, “I am the alchemist!” or to hear your fantasy-repelled family members say, “No, I am the druid!” There’s silliness built into the framework of the game, so the chaotic interactions feel more at home than they would in, say, an 18XX affair. Witch’s Brew is not a perfect game. It’s a specialized tool in that it has a somewhat fragile player count. 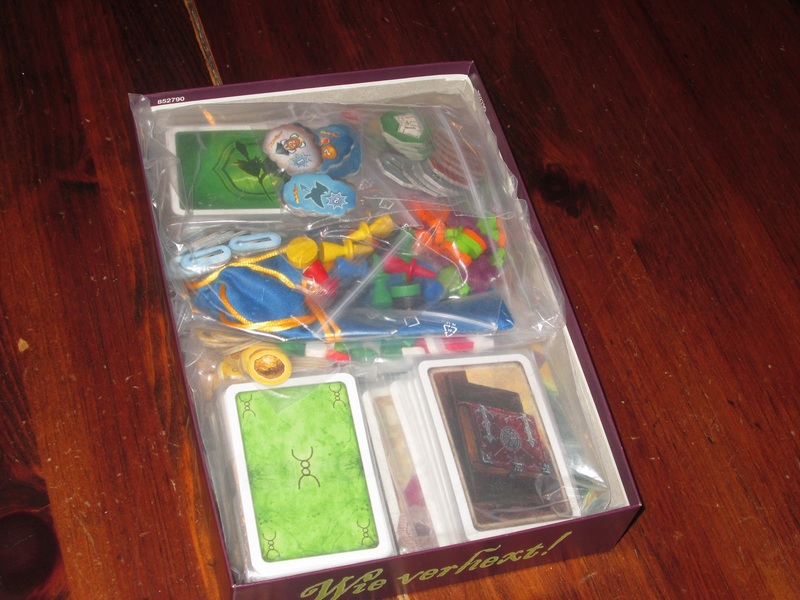 The box advertises play for three to five players, and the three-player game is…not very interesting (even with the expansion that is supposed to spice it up). With the easily obtainable expansion, you can play with up to six, and while I wouldn’t refuse the game at this count, it is a little more chaotic than I like. Witch’s Brew is great with four and nigh perfect with five–both of these counts are the sweet spot. While it seems like a bummer to have a hammer that only works on a few different kinds of nails, I think Witch’s Brew is the perfect tool for the job if what you want is a compelling and engaging social card game with an interesting mechanical hook. So it’s definitely a niche game, but for its niche, it is top rate. The spell book offers a different way to get ingredients or score points each round. Both Witch’s Brew and Broom Service fit in the (smaller) Witch’s Brew box if you get rid of the insert. That’s a lot of game for not a lot of space! Witch’s Brew’s cardplay system has been reimagined by at least two notable games–Glass Road and Broom Service. I’ve not played Glass Road multiplayer, but true to Uwe Rosenberg’s other games, it is a meaty resource-management puzzle and not the breezy, easy-to-teach-and-understand game that Witch’s Brew is. 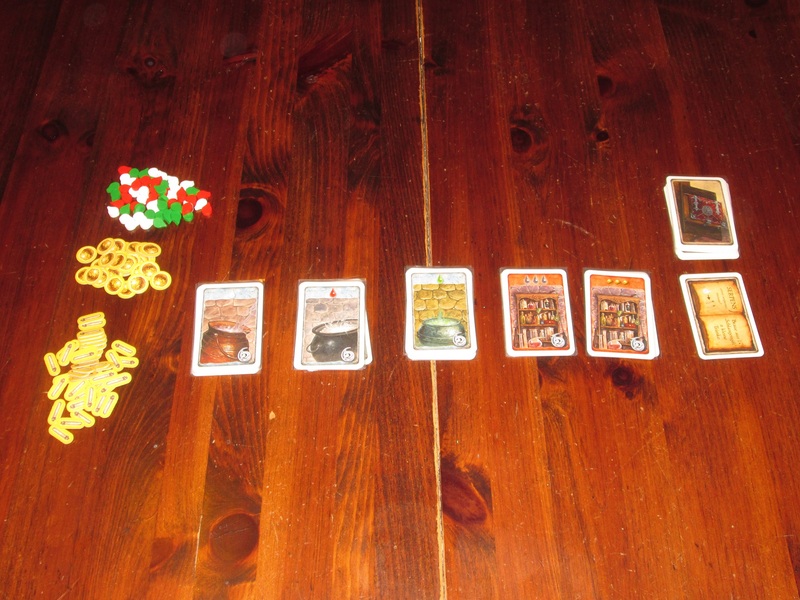 (I have consistently taught and played Witch’s Brew over a lunch hour.) Similarly, Broom Service, reworked by Witch’s Brew’s designer into a game with a board, is more of a strategy game than Witch’s Brew. I enjoy Broom Service, but it feels like an entirely different game, and if I had to choose just one for my collection, I would choose Witch’s Brew. (Thankfully, they both fit in the smaller Witch’s Brew box, so I haven’t had to make that decision.) I think the cardplay system is better suited toward a social game than a more serious strategy game. But as Witch’s Brew is out of print, you won’t be too bad off if you buy Broom Service instead. 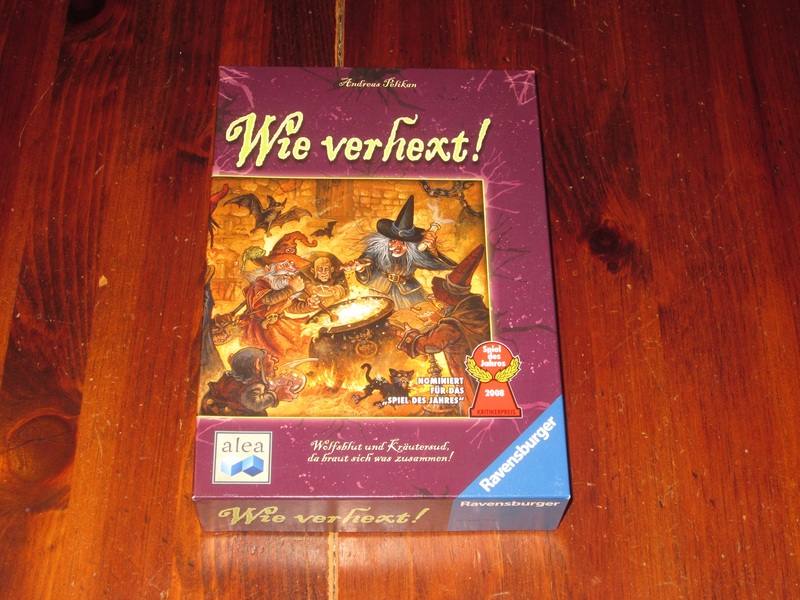 While Witch’s Brew is without doubt worth the $30 I paid to import it from Germany, it is not worth the $85+ some sellers are trying to charge on the secondary market. The snake hunter card in both English and German. While it might scare fewer people off if my copy were in English, it hasn’t been much of a problem since the iconography is clear. I wouldn’t be scared off by the German version in this case. Witch’s Brew is a one-trick pony, but this doesn’t bother me because it is a good trick, and nothing else does anything quite like it (except its derivatives, and I think Witch’s Brew does it better). The cardplay system is ingenious, and beyond being admirable and clever, it’s a fun game that I actually want to play, which isn’t always the case with clever games. It’s a shame that it’s out of print, and my hope is that in this case Vasel’s Law is true so more people can experience the pure joy of stealing actions from your friends–and having your actions stolen in return. Ingenious role selection system that there still is nothing quite like.